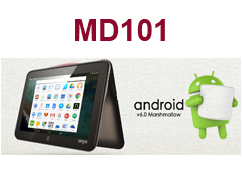 Our latest update to the MD101 now features dual operating system support for both Windows and Android (Marshmallow 6.0). Android offers several benefits such as being a free and open platform, so there is less up-front investment for building up IT infrastructure, and supporting a variety of distribution mechanism for sending service packages, for example, third party stores or a hospital’s own channel. Java-based Android applications make it easy for hospitals to create their own mobile applications when they are ready to add their care flow to include a mobile computing platform. Also, there are millions of existing Android applications that can be leveraged for use by medical professionals. Both Windows and Android operating system applications can facilitate accurate recording of patient vital signs as an important daily task performed by nurses that helps doctors choose the best treatment for patients. Optimizing record taking efficiency and data accuracy by automating vital sign front-line reporting is the winning key to delivering better patient care. With easy integration of ECG devices and an intuitive software user interface, the MD101 works as a gateway to document patient data like NIBP, SpO2, pulse rate, and temperature in HL7 format, a common protocol used by EMR systems. Using the MD101 to record and transfer information automatically to the cloud, doctors can access data within hospitals and outside facilities like hemodialysis centers and nursing homes. •Seamless integration of various devices: BP monitor, respirator, anesthesia machine, injection pump, etc. •Flexible cable management options for pulse oximetry, blood pressure wristband, barcode reader, etc. The MEDPC-2700 is Onyx’s newest fanless, compact medical box PC designed with a robust aluminum enclosure that now supports both Windows and Android operating systems for transferring vital sign data to streaming cloud services. 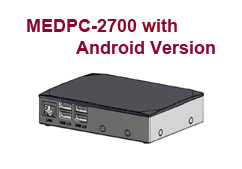 The MEDPC-2700 works as a medical gateway delivering communications faster and with greater flexibility to various medical applications by offering multiple connectivity protocols that continuously transmits data to backend HIS servers for monitoring, recording, and sharing of information between doctors and even patients.